With the start of March break fingers crossed spring is around the corner. As you've probably heard in the media, Toronto's real estate market has been red hot. The Toronto Star captured the sentiment with it's recent headline, "Shortage of new listings fuelling desperation among Toronto home buyers." While overall sales were up in the Toronto market, they were primarily driven by condo sales where there is both a good supply of listings and buyers. In the freehold market a short supply of quality detached, semi's and townhouses kept prices increasing with the average price going up by 8.9% to $599,414. What's interesting to note is that for detached homes the average price increased by 15.7% to $955,314, while townhouses increased by over 20% to $545,043. 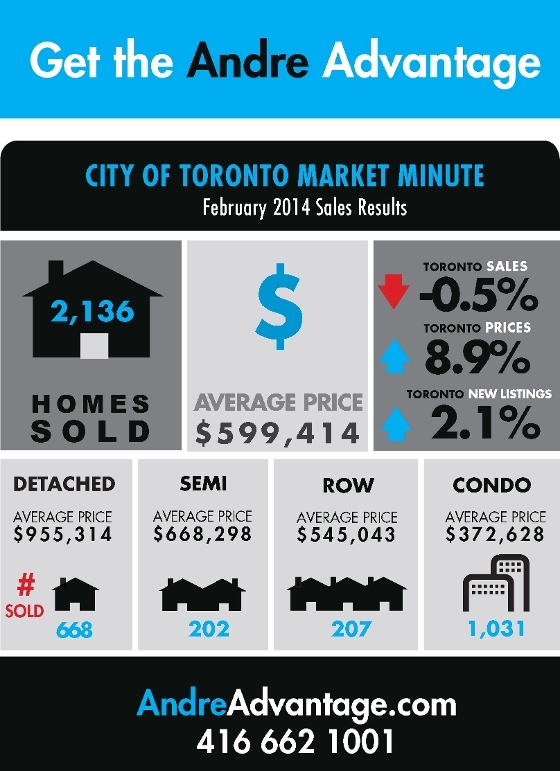 Check out the infographic below for more details on what is happening in Toronot's real estate market. While we should see more listing inventory over the next few months, it's expected that a seller's market is going to persist. With all this said, believe it or not there are still opportunities out there for buyers with some homes not selling on their offer date or only receiving a minimum number of offers, making it much more realistic to compete and mitigating some of the craziness you see when a property gets 25 bids!